VERONICA DAYLIGHT: Vote for Rowan! Rowan is in the running to be on the cover of Parents Magazine and we need your help! She's dropped pretty far down the ranks in only 24 hours cause it's all about votes at this stage so I figured it was time to call on our readers! I know most of you either don't like when bloggers ask for votes or just don't like voting.. but it would really mean a lot to me if you helped out. I voted! I'll vote as much as I can remember too. She definitely deserves to win. Voted! She is just to cute! who wouldn't vote with eyes like those! 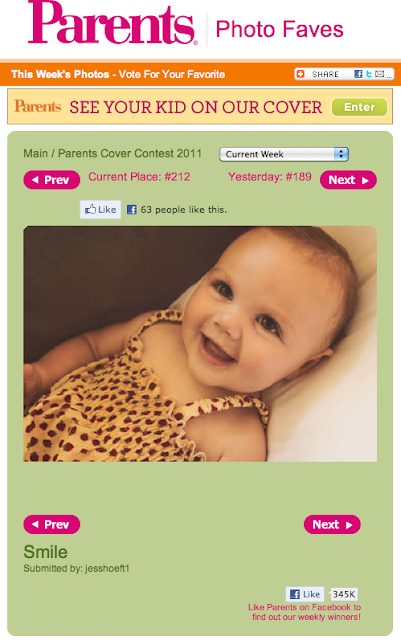 voted:) she's such a cutie! Just voted! Go Rowan go!! I tried to vote but that link sent me to some other much less cute kid's picture. ??? Done and done. Dang she's adorable. It sent me to a different kid too! I wish we could search somehow. VOTED! No offense to the other kids, but how can Rowan NOT win?? ?